Time for another sampling of cheap Italian takeout! This week's sample comes from Alberona's Pizza and Pasta. I've driven by this place on Leary a million times but had yet to try them. Something about the building location and appearance was a bit off-putting, but a review of the menu puts it squarely in the target zone for my ongoing Chicken Parm research project. And I had a coupon! I bought an Entertainment coupon book from the boy who lives a couple houses down. He was selling it as a fundraiser for the Ballard High School Academy of Finance. I remember these coupon books being more expensive, but I think this one was only $30 or maybe $35. So far I've used the Cupcake Royale coupon, the Luisa's Mexican coupon, and two Bartell Drug coupons. I think the Alberona's coupon is putting me over the top on recouping my investment, so now it is all gravy baby! I mention the coupon because it was a little bit of an issue. It was a dark and stormy night and I didn't even feel like driving the mile to get to one of these pseudo-Italian joints for takeout. In the Entertainment coupon book there are coupons for Razzi's (an old stand-by), Olympia in Wallingford, and Alberona's. Alberona's was the only one that did not specify "dine in only", so it was the winner. In fact it clearly says "VALID ANYTIME" with no exclusions whatsoever: buy one entree, get one free, value up to $12.00. I ordered online: one pizza for the girls, Puttanesca for Kim and a Chicken Parm por moi. About 5 minutes later the phone rang. It was Alberona's asking about the coupon, with an assertion that it says Dine In Only. I replied that no it did not say that, and Alberona's said Ok they will honor it. This made me a bit grumpy. They should know what their coupons say. Alberona's if you are reading this, know that the lack of a "dine in only" restriction on the coupon was definitely the tipping point for getting our business. Otherwise I would have ordered from Razzi's. Given that we had a good experience, we will be back to pay full price! Another nitpicky thing is the handling of side dishes. Apparently at Alberona's garlic bread is a side dish. On our entrees we had to choose a side dish: bread or salad. WTF? I award a point to the old standby Razzi's for including garlic bread in every entree plus either soup or salad. Delivery was late. I ordered at 5:20 and delivery was predicted for 6:12 and actually happened around 6:20. Not so bad I guess. I have the guy who delivered my coupon and he did a quick $12.00 deduction from the bill and swiped it on his Stripe iPhone thingy, which seemed pretty flaky. It took about 5 minutes. The food was pretty good! The pizza was lame, but that is par for the course from this type of restaurant. Don't patronize them for the pizza when there are so many better choices. The pizza is strictly an appeasement for the children. The side salads had very fresh and crispy romaine with no outer leaves evident. Kim enjoyed her "puttanesca" -- note this is the Greeky-puttanesca you get at these places. Usually tortellini, usually includes artichoke hearts, and strangely it seemed to have some pesto involved. Maybe it was all a mistake, but I sampled some of it and it was tasty. Chicken Parm was also good. Presentation doesn't count for much. As you can see it is pasta, sauce, some breaded/cheesed up chicken, in a foil container and broiled. But it was pretty good! The chicken was very nice. very light breading, with a decent cheese presence. The pasta was a plain spaghetti. I like it when there is an option for whole wheat pasta, but otherwise this was a good preparation of the dish, and the portion was enough to save 1/3 of it for lunch the next day. I just "won" the auction for this Fortress FX-23 anchor. I've been thinking I need a backup anchor for the boat. I guess "be prepared" was firmly implanted in my psyche by the Boy Scouts of America. The Fortress weighs less than 20 pounds and dis-assembles for storage. But they cost about $300 new! Great ebay opportunity. Anyways, I say I "won" the auction...like there would be any doubt. When you really want to get the best bang for your buck on ebay, you've got to get into the sniping arms race. Ebay isn't what is used to be though. I've got a box of junk I'm getting ready to dispose of there, and I have no doubt at least one of the ten or so items I sell will have some "complication" due to a dishonorable buyer. Did you know sellers can't even log negative feedback on buyers any longer? It is very easy for scammer buyers to exploit the flawed-by-design loophole-ridden feedback and dispute systems. This guy's experience is not unusual, although when I was in a similar situation, the buyer was required to ship my item back at his expense. 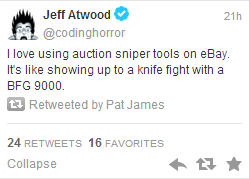 If you don't follow Jeff Atwood on twitter and you are a geek, you are missing out. If you don't get the reference to a BFG9000, please go back two squares in the game of life and play Doom. Is it OK to celebrate the motto "hard work beats talent"? I saw something in some communications from Seattle Prep that has been stuck in my head for a few days, so I am going to try to work it out of my head through this post. Apparently the football team has some tshirts that say something like "Hard Work Beats Talent When Talent Fails to Work Hard." Elizabeth confirmed this is indeed a thing. We talked about this at dinner because it is consistent with a message we try to convey as parents. Persevere. Keep at it. Work hard and you will be rewarded. It reminds me of tales like how many great (or just popular) authors only broke through after submitting the same novel 15 or 20 times. It also reminds me of some tips I read on coaching and parenting: don't say "oh you are so smart! ", say "you are such a hard worker!" because "smart" is a roll of the dice -- some people are born with it, some aren't. Hard work is a habit that can be cultivated and learned, and will pay dividends for anyone. This talk often sets one member of our family off on her trademarked diatribe #37 on how common sense and street smarts trumps book learning and how many truly smart people fail to succeed because they don't persevere, lack a work ethic, or otherwise fail to realize their full potential. I've also been chided by an inebriated friend who once told me that "We had such high hopes for you! ", which resulted in another Pat bestowing upon me the ignominious label of "the most disappointing Pat." I don't take it too seriously, especially given the fact that he woke up the next day with gravel in his hair, missing several possessions, and very limited memory of the preceding evening. I tell you what, if that guy's name was Pat, that morning his wife would have disputed who exactly is the most disappointing Pat. This incident provided ample grist for years of ribbing! Back to hard work vs. talent. Isn't both always better? I am positive that hard work and talent beats untalented hard work every time. Why do these guys get a tshirt with this slogan? It seems that they are saying "hey you talented teams, just wait...as soon as you get complacent and back off from working hard we are going to eat your lunch!" I guess. If the talented teams keep up the hard work, Prep doesn't have a prayer. Which is pretty much how the football season played out. Or so I gather. As most of you know I really pay pretty much zero attention to spectator sports of any kind. I've never set foot inside Husky Stadium and my last Mariners game was in the Kingdome. You may enjoy and need to do the things that are not strengths (let's be honest and call them weaknesses). Hard work at your weaknesses can bring them up to reasonable levels of competence, but they will never be easy, they will never be strengths. That last bit is always the hard one to swallow. Everyone loves to hear about their strengths. It is like doing a Myers-Briggs test and reading all of the wonderful things about your personality type. They never tell you what a fricking nightmare it is to have to be the extreme INTJ working for the extreme ENFP (been there). But what this Strengths Finder thing is saying is: you have weaknesses, and they will always be hard for you. Find ways to spend more time and focus on your strengths (talents) and the world will be your oyster. People like to think "I can just go to school and I will become an artist, or an actor, or a surgeon." Well, maybe. But you may have to work 10 times as hard to get to a median level of success at it, whereas you could turn your strength at shooting 3 pointers into a career in the NBA while sleepwalking. Back to me (because this is my blog and hey it is really all about me here, amiright? ): I love to play poker, but I would never say I have a particular talent for it. I tend to play my cards and not play the other players as much. As Doyle says "poker is not a game about cards, it is a game about people." The exception is when I have spotted a weak player, I think I know how to incorporate that into some positive expected value. I'm not much of a bluffer. When I do bluff though, I make sure to show my cards to try to compensate for other players thinking they have me figured out. It can put them on tilt too. I do work reasonably hard at getting better at poker. I own probably half a dozen tomes on the subject, and I've read them too! But I know I will never be a great player. I enjoy the social aspect and the occasional thrill of victory, but know I should never dive into online or regular cardroom play. They work hard at it. They rarely win. Just like me and poker. A week or so ago I saw a tweet about Eltana Bagels opening up on Stone Way. Who doesn't love a good fresh warm bagel? I'd been meaning to try them out since seeing the tweet. As I was making my way home from the Center for Wooden Boats' surplus sale, I took a flyer and stopped in. Just like the Chicken Parm, I have some memories of great bagel experiences indelibly stamped into my psyche. Above all others I hold the bagel with cream cheese, lox, capers, and red onion (classic!) that I bought at Barney Greengrass in Manhattan when visiting Pat Okell way back, oh maybe 15 years ago when I visited him at Columbia and caught a few Dead shows at MSG. It cost a bundle, maybe $15, but it was so worth it. The portion size took the sting out of the pricetag. That and the top notch fresh products. It was the perfect bagel experience. I took it to go and ate it in Central Park. Quintessential Manhattan bagel experience. When we took the family to New York last spring we made sure to hit H&H. It was good too. I'm no bagel connoisseur, but I do know what I like. So, Eltana. Now that I am home and digesting the bagels, I look at their web site I see they make "Montreal-style" bagels, whatever that means. A quick check of Wikipedia reveals that this is indeed a thing. 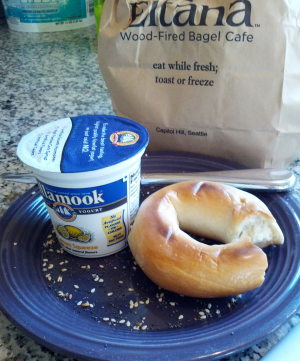 Is Seattle so flush with great bagels that we need "Montreal-style" bagels now? I also see the Wikipedia page reveals that Montreal-style bagels are small. Yes they are indeed! These things are tiny. At first when I walked in I thought "how cute, mini-bagels...OK where are the full size ones?" only to find that this is it. Unfortunately the prices are not commensurately diminutive. A buck a bagel. Baker's dozen for...I think recall it being $11.50. Spreads from $4 to $10. So a half dozen bagels and two spreads ran me a little over $20. Not exactly a cheap treat, but it won't break the bank. The bagels that were clearly fresh and warm were a delight. Nice and crusty on the outside, soft but well cooked on the inside. The problem is that despite stopping in at 9:00 AM on a Saturday, which I would think would be pretty much one of their peak time slots, only one of the three varieties of bagels I bought were actually fresh. The poppy seed and plain bagels...I hate to say it but they seemed like they might even have been day old. Not delightful at all. What is the COGS on one of these mini-bagels anyways? A nickel? Fifteen cents? They can't afford to toss them (or donate them to a soup kitchen) once they cross the "not so fresh" line? If you go, watch for the dude pulling fresh bagels from the oven and buy those, not the ones that were sitting around. Don't count on them to actually be serving fresh bagels just because you came in on a weekend morning. And I had to eat three of them because they were so tiny. I asked the friendly guy at the register why they were so small. His response: "gosh I don't know. A lot of people ask that!" Hmmm...OK...I guess he has never seen that Wikipedia article about Montreal-style bagels. Or received much of any training on the product he sells. Here's a tip to artisnal food producers: when your product is something nobody in your market has seen before and is counter to most everyone's expectations when they come in the door, it might be worth educating your staff with a little "Frequently Asked Questions" knowledge base. I guess even in "this economy" it is hard to find good staff. One more thing that I hope they correct is that they are too hard to find. When you are a retail merchant, what do you want? People to come in the door and BUY. So, make it easy for people to find you. Their web site lists the hours for each store, but you have to dig a bit to find the address. Why don't restaurants and other food retailers put their address right on their home page in a prominent location? You can find it on the "Contact" page, and embedded in the content of an article announcing the opening of the Stone Way store, but that is too hard when you are in your car parked on the side of the road looking for this one...vital...piece of information that is required for me to give you my money. Then when I get to the location there is practically no signage, just a small temporary banner that barely catches your eye from the street. Well, good luck with that! tl/dr: nice tiny bagels that are good when fresh and otherwise nothing special and overpriced. 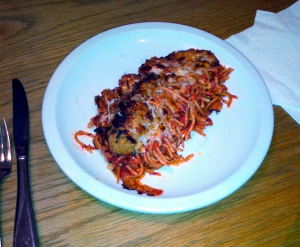 I'm working on a Halloween 2012 Post-Mortem blog post, but while that is still in the editing booth, let me bring you my thoughts on Chicken Parm. I go through periodic phases of culinary obsession. My most recent one was on instant ramen. There is a guy, apparently he lives near Seattle, who has eaten and reviewed over 900 different instant ramen products. Fascinating. Check him out at ramenrater.wordpress or something like that. Google and you will find it. Why someone makes a site with the traffic that thing must pull in and can't be bothered to put it on his own domain or monetize it I don't know. Anyhoo, about a year ago I went through a Chicken Parm phase. I was inspired by a podcast Kim makes me listen to when we are making long passages on the boat: The Sporkful. This is a great food podcast. You can pick up buffet strategies and other useful tips. 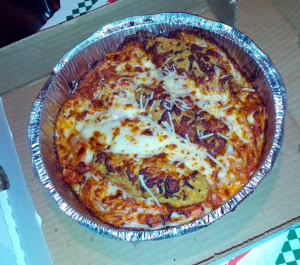 One of the episodes we listened to was specifically on the subject of Chicken Parm. I've always held a vaguely warm spot in my heart for Chicken Parm. I have a very distinct memory of my first ever personal encounter with Chicken Parm, probably at age 23 or 24. It was my first "client dinner" as a consultant at Andersen Consulting. The client was Paccar and we went to some bizarre Italian restaurant near the Southcenter Mall. The restaurant had a sports theme. I forget what it was called. Maybe "Winners"? I took a flyer and ordered the Chicken Parm and that was it, I was sold on this dish. The combination of thin breaded/cheesed chicken breast, pasta, and marinara hits all the right notes. One of the things I like about Chicken Parm is that it is pretty much always a two-meal-meal. Unless you go into the situation ravenous. It comes with bread and a salad usually. What invigorated my fascination with Chicken Parm on listening to the Sporkful was their conclusion that the highest form of Chicken Parm was...the Chicken Parm Sub. You can listen to the podcast for their defense of this argument. I was flabbergasted as I had never personally experienced the Chicken Parm in sandwich form...which led me on my next obsessive quest! I thought this was about Palermo's? Well that is a long intro to a review of the Palermo's Chicken Parm Sub. I'm getting to it. I went on a mission where whenever I could talk the family into Italian takeout or delivery, I would get the Chicken Parm Sub. There are about a half dozen inexpensive Italian restaurants within a two mile radius of our house. These are pretty much entirely the odd Greek-Italian variety. You can always find something on the menu that features gyro meat, which is the giveaway. Razzi's, Palermo's, Soprano's, Amante, Roma Trattoria, and of course the Olympia Pizza and Spaghetti house. I've sampled most of them at this point. They range from the truly awful to, as Elizabeth would put it, "seriously decent." Now I meant to catalog my findings and take notes and come out with a magnum opus on the subject, but I never did! Can you believe it! So now, now that I have this lovely long-form blog, I am taking care of business and revisiting them as a public service, this time with documentation! Palermo is on Market in Ballard. We actually dined in when I tried the Chicken Parm Sub there last year. Tonight we revisited! Well, we got delivery. I ordered online and delivery was fast, about 30 minutes. During the ordering process, I became concerned when I observed that they don't actually offer Chicken Parm the full entree, just the sub. After my extensive research on the subject last year, I concluded that I disagree with the Sporkful guys on the Sub being the highest form of Chicken Parm. For me, the pasta is a delightful component to the dish, and it is only with the full entree that you get to the epic portion size that allows this to stretch to two full meals. I was right to be concerned: the Palermo Chicken Parm Sub is a travesty! Let it be known! First problem: the chicken is all diced up into 1/2" chunks. Seriously Palermo? And the chicken really showed no signs of being breaded or having any parm on it other than a slice or two that was put on after the fact and melted on the sandwich. And the bread was all mushy. It was certainly edible, but falls to near the bottom of the Chicken Parm rankings. Pshaw! Palermo gets kudos for their side salad though. Nice fresh greens. No iceberg or romaine. A little cheese, a slice of tomato, some olives (there's that Greek thing). I think I enjoyed the salad more than the sandwich. So there you have it. Don't go to Palermo for the Chicken Parm Sub!